mmsonline.com January 2017 MMS 87 FEATURE and Preferred Networks. Here, the principle is to conduct data comput- ing and analysis with resources shared within a corporate network, but away from a centralized capability such as a cluster of ser vers in one location. In this usage, "edge" has two connota- tions: computing stays within the boundaries of the network, but away from the center. Like- wise, "fog" computing implies that resources such as CPUs and memory banks in the network can be shared when tasks are distributed among them. If fog is literally a cloud on the ground, then figuratively, fog computing is cloud-like yet stays grounded in the local plant network. The FIELD system is currently proving its value in "deep learning" applications that enable vision- equipped robots to enhance bin-picking capabil- it y. A nalysis of e ach robot's succe ssful and unsuccessful attempts to locate and grasp a randomly sorted part yields new and better rules to guide the robots, making all of them more effective ("smarter") as a group. 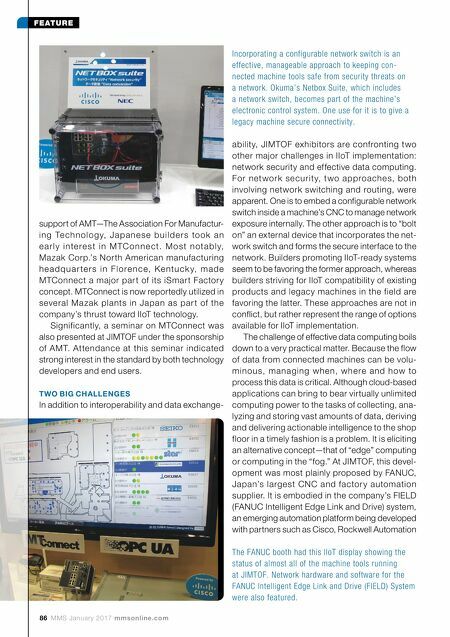 OTHER NOTEWORTHY TRENDS Making machine tools ready for IIoT was certainly not the only significant trend detectable at JIMTOF. 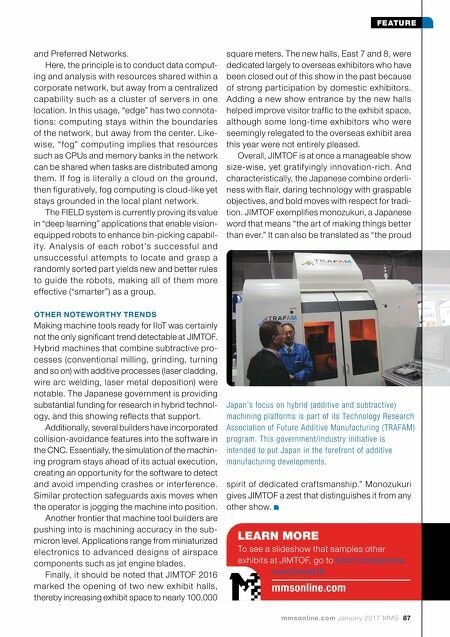 Hybrid machines that combine subtractive pro- cesses (conventional milling, grinding, turning and so on) with additive processes (laser cladding, wire arc welding, laser metal deposition) were notable. The Japanese government is providing substantial funding for research in hybrid technol- ogy, and this showing reflects that support. Additionally, several builders have incorporated collision-avoidance features into the software in the CNC. Essentially, the simulation of the machin- ing program stays ahead of its actual execution, creating an opportunity for the software to detect and avoid impending crashes or inter ference. Similar protection safeguards axis moves when the operator is jogging the machine into position. Another frontier that machine tool builders are pushing into is machining accuracy in the sub- micron level. Applications range from miniaturized electronics to advanced designs of airspace components such as jet engine blades. Finally, it should be noted that JIMTOF 2016 marked the opening of two new exhibit halls, thereby increasing exhibit space to nearly 100,000 Japan's focus on hybrid (additive and subtractive) machining platforms is part of its Technology Research Association of Future Additive Manufacturing (TRAFAM) program. This government/industry initiative is intended to put Japan in the forefront of additive manufacturing developments. square meters. The new halls, East 7 and 8, were dedicated largely to overseas exhibitors who have been closed out of this show in the past because of strong participation by domestic exhibitors. Adding a new show entrance by the new halls helped improve visitor traffic to the exhibit space, although some long-time exhibitors who were seemingly relegated to the overseas exhibit area this year were not entirely pleased. Overall, JIMTOF is at once a manageable show size-wise, yet gratif yingly innovation-rich. And characteristically, the Japanese combine orderli- ness with flair, daring technology with graspable objectives, and bold moves with respect for tradi- tion. JIMTOF exemplifies monozukuri, a Japanese word that means "the art of making things better than ever." It can also be translated as "the proud spirit of dedicated craftsmanship." Monozukuri gives JIMTOF a zest that distinguishes it from any other show. LEARN MORE mmsonline.com To see a slideshow that samples other exhibits at JIMTOF, go to short.mmsonline. com/jimtof16.